Over the past month I participated in two conferences and a couple meetups, but they were all in San Francisco, allowing me to sleep in my own bed every night for several weeks in a row! This has allowed me to spend a couple weekends tinkering on some projects and to go on a few outings with MJ. Unfortunately I was also knocked down a peg by a strep throat, accompanied by a fever, which stole an entire weekend from me in early June. Still, home adventures were had! 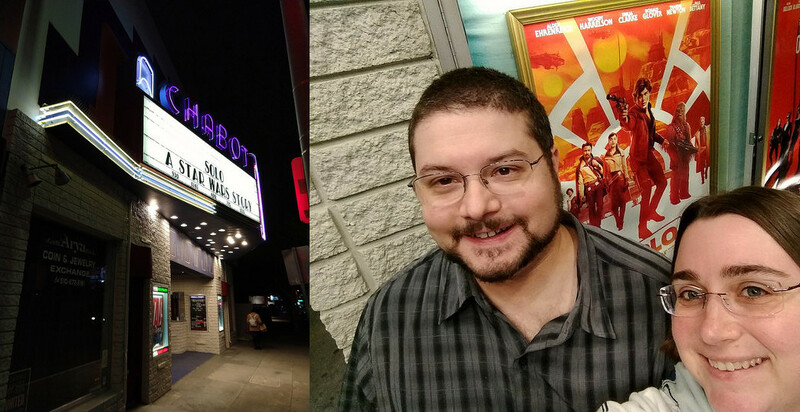 First up was finally making it over to Chabot Cinema, the one-screen movie theater in downtown Castro Valley. There we got to enjoy Solo: A Star Wars Story on the Friday it opened. The theater was probably mid-range quality-wise, it wasn’t as run down as I had feared, but it was certainly no IMAX with reclining seats. It was comfortable and inexpensive, and I could see myself going there regularly if I manage to make time to see movies in the theater anytime soon. Incredibles 2 is playing there now, it’s tempting to head over tomorrow night after MJ leaves for on work trip. MJ had his friend Matti in town for a week, and one of the outings I was able to tag along to was visiting the nearby Castro Valley Farmers’ Market which takes place in the BART parking lot on Saturdays. It was our first time going there, I picked up fruit, a couple frozen meat pies, and hummus. It’s strawberry season now, and the strawberries from these local farmers were some of the best I’ve had in a long time. It was also hot. The east bay gets considerably warmer than San Francisco, so we’ve been seeing summer temperatures climb into the 80s and 90s for several days this month. 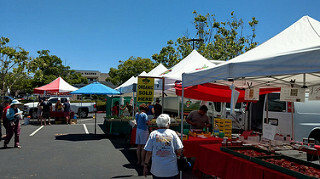 An outdoor farmers’ market was a nice jaunt for a half hour or so, but the temperature encouraged a speedy retreat. Last weekend MJ and I spent our afternoon walking around the Castro Valley Car Show. 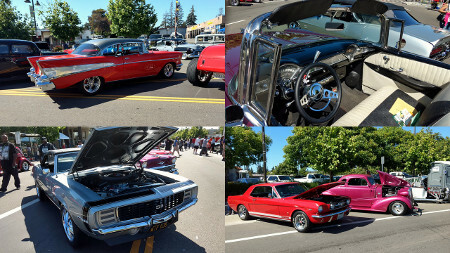 They closed off a decent stretch of Castro Valley Boulevard and packed it with classic cars, live bands, and vendors. Seeing the cars was a lot of fun, getting to drool over the old sports cars that had their engines swapped so they now speed down the highway at unnatural speeds, and the nice collection of Chevrolet Bel Airs whose fins make you believe they may take off from the ground at any minute, if they weren’t so gigantic. It renewed my interest in the hobby of classic cars that I know I’ll never manage to find time for, but it did inspire me to action in another way, digging out the photo album that contained photos my father’s Triumph Spitfire and scanning them so they’d be available online, photos here. With Father’s Day that Sunday, it was a fortuitous time to get them online, and to posthumously thank him for (sadly!) selling the car in favor of a Practical Family Car when I was a kid. It also brought back memories for some of my relatives who remembered the car and saw my Facebook post sharing the photos. We took a break midway through car browsing to grab lunch at the local Thai restaurant, and I browsed shops while MJ stepped away for a haircut. That’s when I had the opportunity to visit World Wide Art, which I’d somewhat written off as your standard local frame shop and gallery. It surprised me upon entering, they have a huge collection of popular art, heavy on Disney themes, but also some Star Wars and others creeping in on the edges. Wow! With my home office already teeming with goodies to go on the walls, I’m not sure how much I’ll be able to buy from their shop, but I’m thrilled that such a place exists in our new home town, and gives me some good ideas for gifts. I also mentioned I’ve had some time for projects. When I was in Vancouver for the OpenStack Summit, I saw one of my former colleagues on the Infrastructure team with a tiny computer. 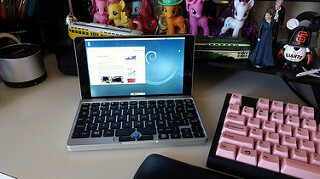 I quickly learned that it was the GPD Pocket and ordered one for myself. It’s the form factor that pulled me in. I’ve been looking for a replacement for my Dell Mini9, a Linux “laptop” that would fit in my purse, ever since my Mini9 ceased to hold a charge, and even the unused replacement batteries were getting old. 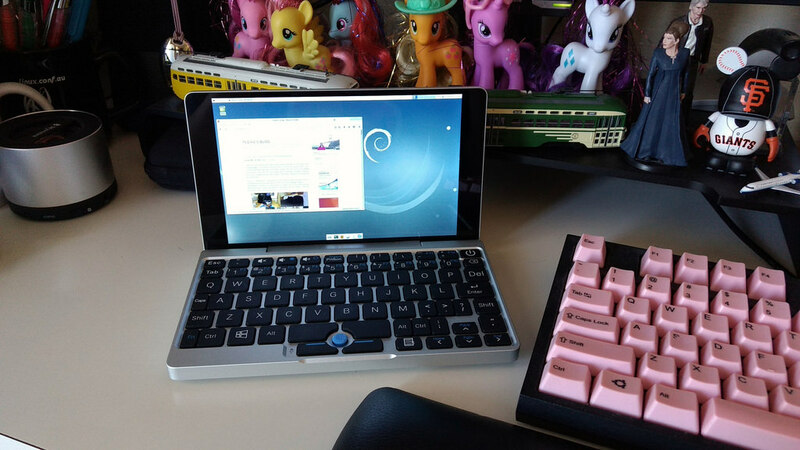 While it’s awkward to type on, the GPD Pocket comes in a bit smaller at 7″ and is super cute. He shared his instructions for installing Debian here and I dutifully followed along, making a couple clarifying statements here and there. The worst part of the process was discovering that the graphical installer for that week on the Debian Testing image was faulty. This was compounded by knowing that a lot of people struggled with limited power coming from the USB port, so at first I believed the USB port was to blame, finally after a couple hours I tried the installer on another laptop and learned that it indeed was the culprit. From there, I just used the text-based installer. The only lingering issue I can think of is the screen rotation, which defaults to portrait for grub, lightdm and the desktop itself (console is fine, which makes for a trippy boot-up sequence). The desktop was easy to fix, the others will take some fiddling. I don’t know that I’ll ever grow accustom to the keyboard, but I won’t be writing the next Great American Novel on it, it’s more about a better solution than my phone or tablet for things like on the go email writing and IRC. I can’t speak to the reliability of it yet, but the form factor is quite slick and I like the feel of it. The next weekend, inspired by Ubuntu colleague Nathan Haines doing the same, I got to play with some more hardware, this time pulling my BQ Aquaris M10 tablet off the shelf to reinstall Ubuntu Touch on it. 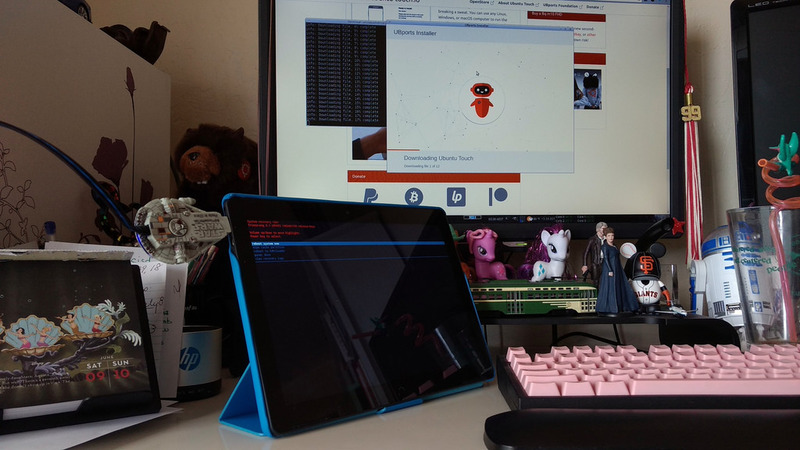 I had flashed it with Android after it lost support from Canonical, but today at team over at Ubports has picked up where they left off to continue development and support for Ubuntu Touch. 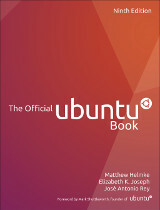 Since I had installed Android on it, first I had to reflash it with an old version of Ubuntu Touch, which took a few tries due to my not reading the instructions properly the first time around. Then the super easy installer they wrote took over and I was up and running with the new version in no time. I’m really happy with how easy they’ve made it, no more fiddling around with adb yourself, you just plug it in and go. I don’t have any grand travel planned for work over the next couple months, but we will be going back to Philadelphia a couple times to sort through boxes and eventually get everything we’re not using there shipped out here to California. Not exactly a lot of fun, but it needs to be done and I’ll be happy when the den at the townhouse in Philadelphia isn’t packed with boxes and is instead set up as our home office. Our first trip begins this Friday, and we’ll be spending the 4th of July week there before parting ways, with me taking the Acela up to Boston for a couple days to participate in an organizing committee meeting for a conference I’m a talk chair for. It should be an interesting summer. This entry was posted on Saturday, June 23rd, 2018 at 10:07 am and is filed under castro valley, computers. You can follow any responses to this entry through the RSS 2.0 feed. Both comments and pings are currently closed. Entries (RSS) and Comments (RSS). 21 queries. 0.081 seconds.